We know you missed us. Sorry! Life got in the way of us following the bracketology trail these last few years. But that doesn’t matter. We’re back. That does matter. For now, we’ve got the seeding list for you. Bracket to follow soon. Automatic bids are given to first place teams. If there is a tie atop the conference, we chose the team we deem to have the best resumé. 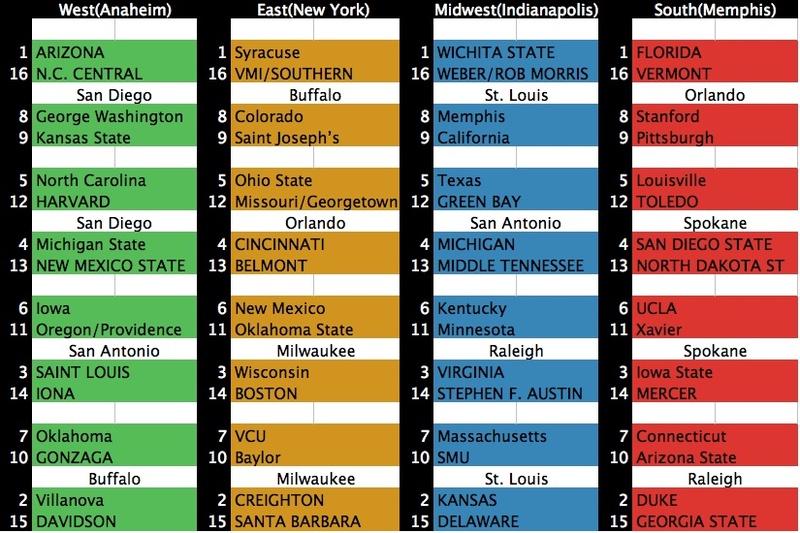 Conference champions are in ALL CAPS, excluding VCU and SMU. Southern will remain eligible for our bracket until the NCAA rules on their case or the beginning of the SWAC tournament. 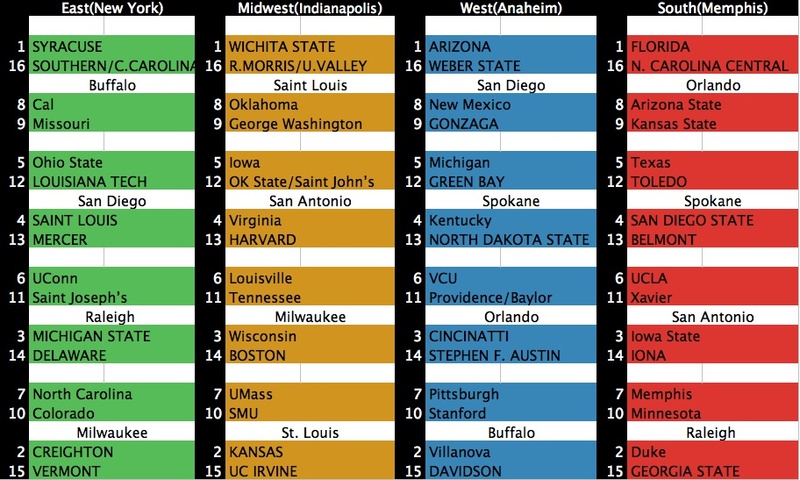 Due to incredibly busy schedules, Seeding68 has not released its first bracket of the season until now. Selection Sunday is only a few weeks away, so expect updates twice a week! Automatic bids are given to first place teams. If there is a tie atop the conference, we chose the team we deem to have the best resumé. Two smaller schools that know how to win tournament games face off at 12:40 ET in Lexington. Both teams are lead by phenominal players; Mike Muscala for Bucknell and Arkansas transfer Rotnei Clarke for Butler. Most people know these two players, but what about the rest of the team? This gives Butler a clear advantage. Bucknell seems to be four, maybe five deep. The Bison have just four players averaging more than 3 points a game. Butler, though not the deepest team themselves, does have a bench deep enough to win two games over a weekend. With that, Muscala still may be a huge matchup problem for Butler. Senior Center Andrew Smith, an important role player on the 2011 team, will need to limit Muscala’s scoring and keep him off the glass. This game should be entertaining. Michigan State continues to be one of the nation’s most steady programs, making yet another NCAA Tournament appearance. Valpo, on the other hand, broke into the NCAA Tournament for the first time since 2004. Valparaiso is a senior and foreign heavy team, who seemed like the favorites to win the Horizon all season. Late heroics in the Conference Semi-finals lifted them to this opportunity. Frankly, we thought the Crusaders were a bit under-seeded, certainly should have been a 13 seed and maybe even a 12. Nonetheless, we’re not convinced they will be much of a match for the Spartans. Like any Tom Izzo lead team, Michigan State will be too good on the boards. If MSU is hitting their outside shots, there will be no Bryce Drew miracle today. This year’s final two at-large teams take off in what should be a very evenly matched game. Unfortunately, the winner has to go to Kansas City for a de facto home game for Kansas State. This is still a major opportunity nonetheless. Despite playing on opposite ends of the continent, these teams are very even on paper. La Salle has not danced since 1992 (before we were born!) and had it not been for the 68-team bracket they would be waiting another year. The Explorers are led by their lone senior Ramon Galloway. He has impressive numbers across the board, but will need to protect the ball help his team advance. Three-point specialist D.J. Peterson could be the X-factor in this game. He plays 25 minutes a game and most of his shots come from outside the arch, where he shoots 40%. Boise State has benefited from the ultra-competitive Mountain West Conference, earning their second bid in five years. If the Broncos are to win their first NCAA Tournament game, the Broncos will need Anthony Drmic to deliver another 20+ point night, something he has done in 6 of the last 7 games. Derrick Marks is also capable of scoring a lot of points. He has scored 30 or more three times this season, including in wins over tournament teams Colorado State and Creighton. The Broncos will need a good game from Portland native Jeff Elorriaga. His production has been inconsistent throughout the season. This game will be a lot of fun. The teams are very even, and very young. La Salle has 1 senior contributor while Boise State has none. If anything, watch this game to check out two teams who should be even better next year. 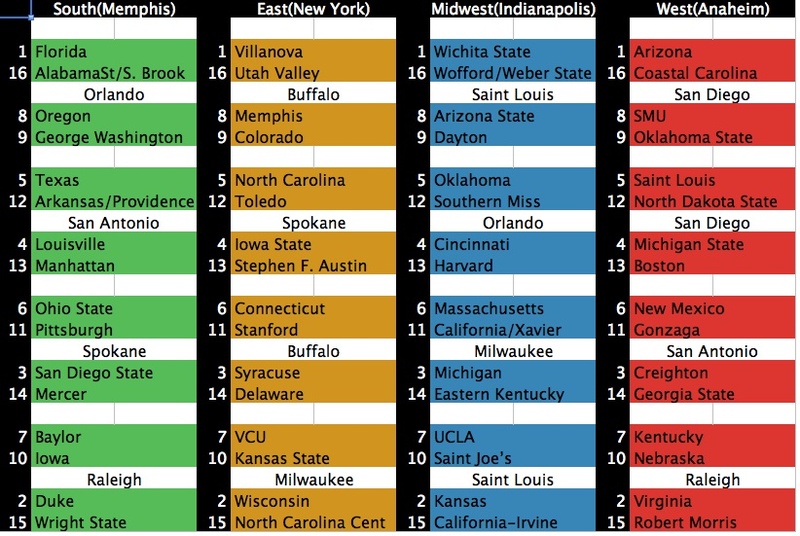 Predicting67 — East — (1) Syracuse v. (8) Kansas St.